Rob Imes has a Kickstarter project on now for the publication of DITKOMANIA #93, the next issue of his on-going fanzine. If it makes its funding goal, this issue features at least 32 pages with a focus on Ditko's monsters, especially the Charlton movie spin-off comics of the 1960s featuring Konga and Gorgo. Check it out, both print and digital editions available, plus other premiums for higher funding amounts. 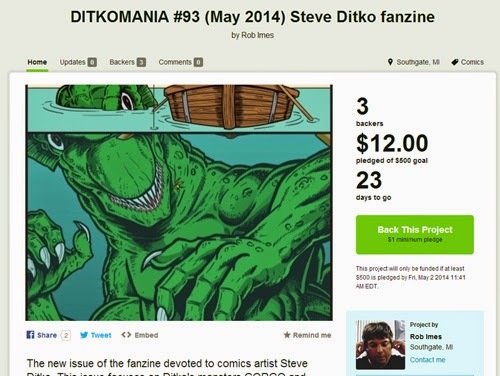 And as usual, subscription information for DITKOMANIA is over here.